From one place, you can search across many disciplines and sources: articles, theses, books, abstracts and court opinions, from academic publishers, professional societies, and other sources. Google Scholar provides links to Dupré Library to check for availability. 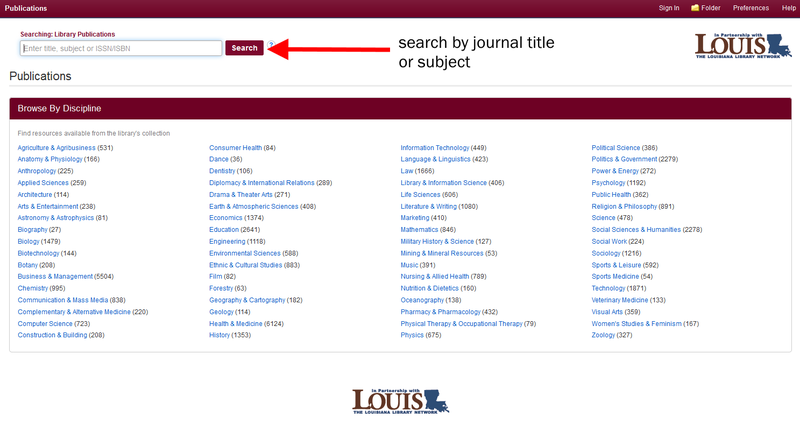 Include 'library.louisiana.edu' in the Library links section of your Google Scholar settings to automatically link to full-text through the Library. **Need help searching the nursing databases? (formerly CINAHL Plus with Full Text) Full text articles for over 1300 peer reviewed nursing and allied health journals. Also includes Evidence-Based Care Sheets. Provides full text access to more than 2,400 medical journals. Full text, peer reviewed articles from leading nursing, allied health and related publications. Index with over 15 million citations for articles from biomedical journals. Includes links to full text articles and other related resources. A service of the National Library of Medicine. Provides full-text scientific journal articles and book chapters from more than 2,500 journals and almost 20,000 books. Subject coverage includes nursing and health professions, life sciences, and medicine and dentistry. A comprehensive scholarly, multidisciplinary full text database with more than 5,300 full text periodicals, including 4,400 peer reviewed journals. Full text, peer reviewed journal articles on complementary and alternative medicine. A collection of databases that contain different types of high quality, independent evidence to inform heathcare decision-making. Includes Cochrane Database of Systematic Reviews, Cochrane Central Register of Controlled Trials, Cochrane Methodology Register, Database of Abstracts of Reviews of Effects, Health Technology Assessments Database and NHS Economic Evaluation Database. A comprehensive index of the top scholarly research journals in the social sciences. *Note: This resource has citations only, but will link to a full text article if one is available through Dupré Library. If the full text article is not available through the library, you can order a copy through Interlibrary Loan. Evidence-based, physician authored clinical decision resources for determining point-of-care decisions. Peer reviewed. What does "peer-reviewed" mean? What's the difference between a peer-reviewed, scholarly article and a popular article? A peer-reviewed article is reviewed by subject experts before being approved for publication in order to ensure that it meets specific criteria and standards. Academic journals that use peer review in their selection process are generally considered to be of higher quality and more trustworthy than those that don’t use the peer review process. Popular articles are found in sources intended for a general audience, and they are often available freely online. Examples include Time magazine, The New York Times and The Huffington Post. When conducting academic research, your professors will often require you to use only scholarly, peer-reviewed journal articles. How do I find peer-reviewed articles? You can find peer-reviewed articles by searching our databases. Most databases give you the option to select for peer-reviewed articles when conducting your search. 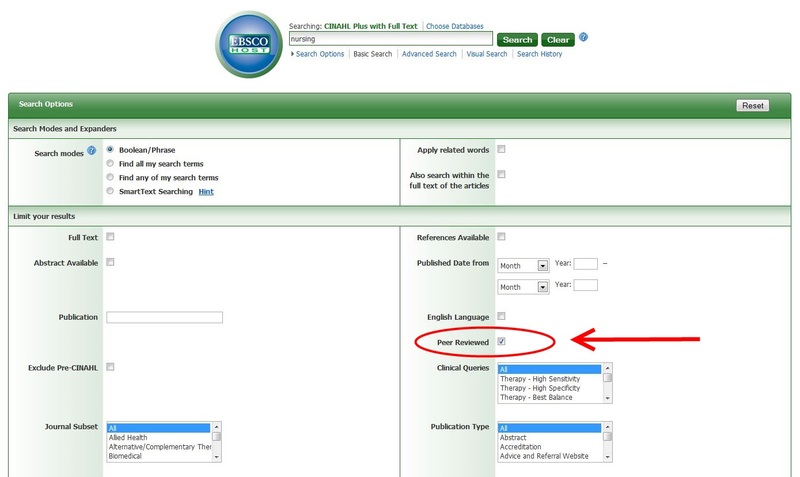 Check the "Peer Reviewed" box to ensure all the articles in your search results come from peer-reviewed journals. Need to know if we have an online subscription to a particular journal? Try conducting a title search in our Publication Finder, which provides access to all of our electronic journal subscriptions. Publication Finder also allows you to browse by discipline. Many online databases link to full-text articles, either directly or through the Library's LinkSource service. If the article is not available full-text, LinkSource can search the Library's holdings for a print copy of the article. LinkSource also facilitates an ILLiad request when a Dupré Library copy is not available, which allows you to order the article via Interlibrary Loan. Look for the Link Source logo when using online databases.